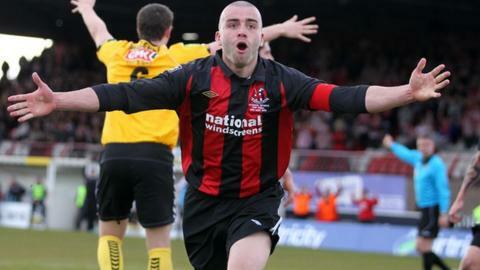 Crusaders are boosted by the return of skipper Colin Coates for Tuesday night's Co Antrim Shield semi-final against Linfield at Seaview (1945 GMT). The Northern Ireland defender has been out since August with an ankle injury. Gareth McKeown is banned, along with Linfield trio Billy Joe Burns, David Armstrong and Mark McAllister. Ballymena host Donegal Celtic in the other semi with the Sky Blues missing Mark Surgenor after his dismissal in Saturday's draw with Ballinamallard. United knocked holders Cliftonville out in the quarter-finals and are seeking to win a trophy for the first time in 23 years. Donegal Celtic will travel to the Showgrounds on a high after the 2-1 weekend victory over Glentoran gave them their first Premiership win of the campaign. McKeown was red-carded in the 1-1 draw with Coleraine at Seaview while McAllister's was sent-off in Linfield's 1-0 win over Portadown. Paul Leeman is back in the Crues squad. Blues boss David Jeffrey is set to make changes for the clash with the Crues after saying he will "freshen things up" following the Ports game at Windsor Park on Saturday.